BASSETERRE, St. Kitts – Prime Minister the Honourable Dr. Timothy Harris will once again play a leading role in the fight against noncommunicable diseases (NCDs) when he leads a group of health-conscious citizens on an early morning walk along the length of Constituency #7, the area which he represents in the federal Parliament. After a brief pause for the Christmas/Carnival season, Prime Minister Harris’s monthly health walks return this Saturday, Jan, 27. Saturday’s walk commences at the bus stop in Belle Vue at 5:30 a.m. and will take participants through the villages of Tabernacle, Mansion, Christchurch, Bourryeau, Lodge and Lodge Project before ending at the Ottley’s Hard Court. 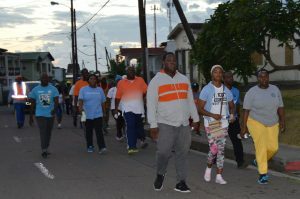 Harris, who is the lead spokesman in the CARICOM Quasi Cabinet with responsibility for human resources, health and HIV matters, hopes his monthly health walks will continue to promote healthy living by residents and citizens, which in turn can lead to the overall reduction of NCDs in St. Kitts and Nevis. After realizing an increase in the participation from people residing outside of Constituency #7, organizers of the Prime Minister’s Monthly Health Walk made the decision in 2017 to take the walks to other constituencies throughout St. Kitts. 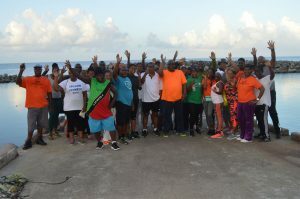 On July 1, 2017, walkers gathered at St. Peter’s in Constituency #8, walked along the island main road, passing through Constituency #2 before ending at the lawns in Frigate Bay in Constituency #1. Later that month, on July 29, another walk commenced at the Basseterre Fire Station in Constituency #1, going through Constituency #2, and ending on the lawns at West Farms in Constituency Number #3. The third health walk held outside Constituency 7 was traversed entirely in Constituency #4 on Aug. 26, taking walkers from New Guinea to Challengers. The fourth walk in the series covered the entire length of Constituency #6 on Nov. 4. The Prime Minister’s Monthly Health Walk started in 2007 as the Constituency Number Seven Health Walk.